"Hyo" redirects here. For other uses, see Hyo (disambiguation). Scene from the Song Dynasty Illustrations of the Classic of Filial Piety (detail), depicting a son kneeling before his parents. In Confucian and Chinese Buddhist ethics, filial piety (Chinese: 孝, xiào) is a virtue of respect for one's parents, elders, and ancestors. The Confucian Classic of Filial Piety, thought to be written around the Qin-Han period, has historically been the authoritative source on the Confucian tenet of filial piety. The book, a purported dialogue between Confucius and his student Tseng Tzu, is about how to set up a good society using the principle of filial piety. Filial piety is central to Confucian role ethics. In more general terms, filial piety means to be good to one's parents; to take care of one's parents; to engage in good conduct not just towards parents but also outside the home so as to bring a good name to one's parents and ancestors; to show love, respect and support; display courtesy; to ensure male heirs, uphold fraternity among brothers; wisely advise one's parents, including dissuading them from moral unrighteousness; display sorrow for their sickness and death; to bury them and carry out sacrifices after their death. Filial piety is considered a key virtue in Chinese and other East Asian cultures, and it is the main subject of a large number of stories. One of the most famous collections of such stories is The Twenty-four Cases of Filial Piety (Chinese: 二十四孝; pinyin: Ershi-si xiao). These stories depict how children exercised their filial piety in the past. While China has always had a diversity of religious beliefs, filial piety has been common to almost all of them; historian Hugh D.R. Baker calls respect for the family the only element common to almost all Chinese people. The western term filial piety was originally derived from studies of Western societies, based on Mediterranean cultures. However, filial piety among the ancient Romans, for example, was largely different from the Chinese in its logic and enactment. Filial piety is illustrated by the Chinese character xiao (孝). The character is a combination of the character lao (old) above the character zi (son), that is, an elder being carried by a son. This indicates that the older generation should be supported by the younger generation. In Korean Confucianism, the character 孝 is pronounced hyo (효). In Vietnamese, the character 孝 is written in the Vietnamese alphabet as hiếu. In Japanese, the term is generally rendered in spoken and written language as 親孝行, oyakōkō, adding the characters for parent and conduct to the Chinese character to make the word more specific. 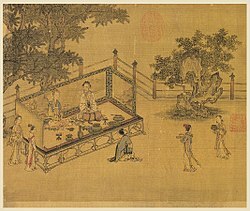 Illustrations of the Ladies' Classic of Filial Piety (detail), Song Dynasty, depicting the section "Serving One's Parents-in-Law". Confucian teachings about filial piety can be found in numerous texts, including the Four Books, that is the Great Learning (Chinese: 大学), the Doctrine of the Mean (Chinese: 中庸), Analects (Chinese: 论语) and the book Mencius, as well as the works Classic of Filial Piety (Chinese: 孝经) and the Book of Rites (Chinese: 礼记) . In the Classic of Filial Piety, Confucius (551–479 BCE) says that "[f]ilial piety is the root of virtue and the basis of philosophy" and modern philosopher Fung Yu-lan describes filial piety as "the ideological basis for traditional [Chinese] society". For Confucius, filial piety is not merely ritual outside respect to one's parents, but an inward attitude as well. Filial piety consists of several aspects. Filial piety is an awareness of repaying the burden born by one's parents. As such, filial piety is done to reciprocate the care one's parents have given. However, it is also practiced because of an obligation towards one's ancestors. According to some modern scholars, xiào is the root of rén (仁; benevolence, humaneness), but other scholars state that rén, as well as yì (義; righteousness) and li (禮; propriety) should be interpreted as the roots of xiào. Rén means favorable behavior to those who we are close to. Yì refers to respect to those considered worthy of respect, such as parents and superiors. Li is defined as behaving according to social norms and cultural values. Moreover, it is defined in the texts as deference, which is respectful submission, and reverence, meaning deep respect and awe. Filial piety was taught by Confucius as part of a broad ideal of self-cultivation (Chinese: 君子; pinyin: jūnzǐ) toward being a perfect human being. Modern philosopher Hu Shih argued that filial piety gained its central role in Confucian ideology only among later Confucianists. He proposed that Confucius originally taught the quality of rén in general, and did not yet emphasize xiào that much. Only later Confucianists such as Tseng Tzu focused on xiào as the single, most important Confucianist quality. Koteiken, one of The Twenty-four Cases of Filial Piety, depicted emptying a chamber pot for his mother. 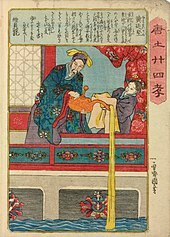 Utagawa Kuniyoshi, 1848. Confucian ethics does not regard filial piety as a choice, but rather as an unconditional obligation of the child. The relationship between parents and children is the most fundamental of the five cardinal relationships (Chinese: 五倫; pinyin: wǔlún) described by Confucius in his role ethics, and filial piety, together with fraternal love, underlies this system. It is the fundamental principle of Confucian morality: filial piety was seen as the basis for an orderly society, together with loyalty of the ministers toward the ruler, and servitude of the wife toward the husband. In short, filial piety is central to Confucian role ethics and is the cardinal virtue, that defines, limits or even eliminates all other virtues. According to the traditional texts, filial piety consists of physical care, love, service, respect and obedience. Children should attempt not to bring their parents in disgrace. Confucian texts such as Book of Rites give details on how filial piety should be practiced. Respect is envisioned by detailed manners such as the way children salute their parents, speak to them (words and tone used) or enter and leave the room in which their parents are, as well as seating arrangements and gifts. Care means making sure parents are comfortable in every single way: this involves food, accommodation, clothes, hygiene, and basically to have them "see and hear pleasurable things", in Confucius' words, and to have them live without worry. But the most important expression of and exercise in filial piety were the burial and mourning rituals to be held in honor of one's parents. Filial piety means to be good to one's parents; to take care of one's parents; to engage in good conduct not just towards parents but also outside the home so as to bring a good name to one's parents and ancestors; to perform the duties of one's job well (preferably the same job as one's parents to fulfill their aspirations) as well as to carry out sacrifices to the ancestors; not be rebellious, to be polite, and well-mannered; to show love, respect and support, to be near home to serve one's parents; display courtesy; ensure male heirs, uphold fraternity among brothers; wisely advise one's parents, including dissuading them from moral unrighteousness; display sorrow for their sickness and death; bury them and carry out sacrifices after their death. Furthermore, a filial child should promote the public name of its family, and it should cherish the affection of its parents. Traditional texts essentially describe filial piety in terms of a son–father relationship, but in practice, it involves all parent–child relationships, as well as relationships with stepparents, grandparents and ancestors. But filial piety also involves the role of the parent to the child. The father has a duty to provide for the son, to teach him in traditions of ancestor worship, to find a spouse for him, and leave a good heritage. A father is supposed to be 'stern and dignified' to his children, whereas a mother is supposed to be 'gentle and compassionate'. The parent's virtues are to be practiced, regardless of the child's piety, and vice versa. Nevertheless, filial piety mostly identified the child's duty, and in this, it differed from the Roman concept of patria potestas, which defined mostly the father's authoritative power. Whereas in Roman culture and later in the Judeo-Christian West people in authority legitimated their influence by referring to a higher transcending power, in Chinese culture authority was defined by the roles of the subordinates (son, subject, wife) to their superior (fathers, emperor, husband) and vice versa. As roles and duties were depersonalized, supremacy became a matter of role and position, rather than person, as it was in the West. Anthropologist Francis Hsu argued that a child's obedience from a Confucian perspective was regarded as unconditional, but anthropologist David K. Jordan and psychologist David Yau-fai Ho disagree. Jordan states that in classical Chinese thought, 'remonstrance' was part of filial piety, meaning that a pious child needs to dissuade a parent from performing immoral actions. Ho points out in this regard that the Confucian classics do not advocate 'foolish filial piety' (pinyin: yuxiao). However, Jordan does add that if the parent does not listen to the child's dissuasion, the child must still obey the parent, and Ho states that "rebellion or outright defiance" is never approved in Confucian ethics. Filial piety not only extends to behavior of children toward their parents, but also involves gratitude toward the human body they received from their parents, as the body is seen as an extension of one's parents. This involves prohibitions on damaging or hurting the body, and this doctrine has affected how the Confucianists regarded the shaving of the head by Buddhist monks, but also has created a taboo on suicide, regarded as 'unfilial behavior' (Wade–Giles: pu-hsiao). A memorial stone at a Korean elementary school, with the inscription "filial piety". Filial piety is regarded as a principle that ordered society, without which chaos would be prevail. It is described as "an inevitable fact of nature", as opposed to mere convention, and it is seen to follow naturally out of the father–son relationship. In the Chinese tradition of patriarchy, roles are upheld to maintain the harmony of the whole. According to the Neo-Confucian philosopher Cheng Hao (1032–1085 CE), relationships and their corresponding roles "belong to the eternal principle of the cosmos from which there is no escape between heaven and earth". The idea of filial piety became popular in China because of the many functions it had and many roles it undertook, as the traditional Confucian scholars such as Mencius (4th century BCE) regarded the family as a fundamental unit that formed the root of the nation. Though the virtue of xiào was about respect by children toward their parents, it was meant to regulate how the young generation behaved toward elders in the extended family and in society in general. Furthermore, devotion to one's parents was often associated with one's devotion to the state,[note 1] described as the "parallel conception of society" or the "Model of Two". The Classic of Filial Piety states that an obedient and filial son will grow up to become a loyal official (pinyin: chung)—filial piety was therefore seen as a truth that shaped the citizens of the state, and the loyalty of the minister to his emperor was regarded as the extension of filial piety. Filial piety was regarded as being a dutiful person in general. Nevertheless, the two were not equated. Mencius teaches that ministers should overthrow an immoral tyrant, should he harm the state—the loyalty to the king was considered conditional, not as unconditional as in filial piety towards one parents. Confucian teachings about filial piety have left their mark on East Asian languages and culture. In Chinese, there is a saying that "among hundreds of behaviors, filial piety is the most important one" (pinyin: bai xing xiao wei xian). In modern Chinese, filial piety is rendered with the words Xiao xun, meaning 'respect and obedience'. While China has always had a diversity of religious beliefs, filial piety has been common to almost all of them; historian Hugh D.R. Baker calls respect for the family the only element common to almost all Chinese people. Historian Ch'ü T'ung-tsu stated about the codification of patriarchy in Chinese law that "[i]t was all a question of filial piety". Filial piety also forms the basis for the veneration of the aged, for which the Chinese are known. However, filial piety among the Chinese has led them to be mostly focused on taking care of close kin, and be less interested in wider issues of more distant people: nevertheless, this should not be mistaken for individualism. In Japan, however, devotion to kinship relations was and still is much more broadly construed, involving more than just kin. In Korean culture, filial piety is also of crucial importance. In Taiwan, filial piety is considered one of eight important virtues, among which filial piety is considered supreme. It is "central in all thinking about human behavior". Taiwan generally has more traditional values with regard to the parent–child relationship than the People's Republic of China (PRC). This is reflected in attitudes about how desirable it is for the elderly to live independently. According to R.M. Lee, in the final stage of the development of filial piety, it is a means to realize one's ethical ideals. Social scientists have done much research about filial piety and related concepts. It is a highly influential factor in studies about Asian families and intergenerational studies, as well as studies on socialization patterns. Filial piety has been defined by several scholars as the recognition by children of the aid and care their parents have given them, and the respect returned by those children. Psychologist K.S. Yang has defined it as a "specific, complex syndrome or set of cognition, affects, intentions, and behaviors concerning being good or nice to one's parents". As of 2006, psychologists measured filial piety in inconsistent ways, which has prevented much progress from being made. Ancestor respect: commemorating ancestors and making sacrifices for them. These forms of respect are based on qualitative research. Some of these forms involve some action or work, whereas other forms are more symbolic. Female elders tend to receive more care respect, whereas male elders tend to receive more symbolic respect. Apart from attempting to define filial piety, psychologists have also attempted to explain its cognitive development. Psychologist R.M. Lee distinguishes a five-fold development, which he bases on Lawrence Kohlberg's theory of moral development. In the first stage, filial piety is comprehended as just the giving of material things, whereas in the second stage this develops into an understanding that emotional and spiritual support is more important. In the third stage, the child realizes that filial piety is crucial in establishing and keeping parent–child relationships; in the fourth stage, this is expanded to include relationships outside of one's family. In the final stage, filial piety is regarded as a means to realize one's ethical ideals. Psychologists have found correlations between filial piety and lower socio-economic status, female gender, elders, minorities, and non-westernized cultures. Traditional filial piety beliefs have been connected with positive outcomes for the community and society, care for elder family members, positive family relationships and solidarity. On the other side, it has also been related to an orientation to the past, resistance to cognitive change, superstition and fatalism; dogmatism, authoritarianism and conformism, as well as a belief in the superiority of one's culture; and lack of active, critical and creative learning attitudes. Ho connects the value of filial piety with authoritarian moralism and cognitive conservatism in Chinese patterns of socialization, basing himself on findings among subjects in Hong Kong and Taiwan. He defines authoritarian moralism as hierarchical authority ranking in family and institutions, as well as the pervasiveness of using moral precepts as criteria of measuring people. Cognitive moralism he derives from social psychologist Anthony Greenwald, and means a "disposition to preserve existing knowledge structures" and resistance to change. He concludes that filial piety appears to have a negative effect on psychological development, but at the same time, partly explains the high motivation of Chinese people to achieve academic results. In family counselling research, filial piety has been seen to help establish bonding with parents. Ho argues that the value filial piety brings along an obligation to raise one's children in a moral way to prevent disgrace to the family. However, filial piety has also been found to perpetuate dysfunctional family patterns such as child abuse: there may be both positive and negative psychological effects. Francis Hsu made the argument that when taken to the level of the family at large, pro-family attitudes informed by filial piety can lead to nepotism, corruption and eventually are at tension with the good of the state as whole. In Chinese parent–child relations, the aspect of authority goes hand-in-hand with the aspect of benevolence. E.g. many Chinese parents support their children's education fully and do not allow their children to work during their studies, allowing them to focus on their studies. Because of the combination of benevolence and authoritarianism in such relations, children feel obliged to respond to parents' expectations, and internalize them. Ho found, however, that in Chinese parent–child relations, fear was also a contributing factor in meeting parents' filial expectations: children may not internalize their parents' expectations, but rather perform roles as good children in a detached way, through affect–role dissociation. Studying Korean family relations, scholar Dawnhee Yim argues that internalization of parents' obligations by children may lead to guilt, as well as suppression of hostile thoughts toward parents, leading to psychological problems. Jordan found that despite filial piety being asymmetrical in nature, Chinese interviewees felt that filial piety contained an element of reciprocity: "... it is easy to see the parent whom one serves today as the self who is served tomorrow." Furthermore, the practice of filial piety provides the pious child with a sense of adulthood and moral heroism. The origins of filial piety in East Asia lie in ancestor worship, and can already be found in the pre-Confucian period. Epigraphical findings such as oracle bones contain references to filial piety; texts such as the Classic of Changes (10th–4th century BCE) may contain early references to the idea of parallel conception of the filial son and the loyal minister. In the T'ang dynasty (6th–10th century), not performing filial piety was declared illegal, and even earlier, during the Han dynasty (2nd century BCE–3rd century CE), this was already punished by beheading. Behavior regarded as unfilial such as mistreating or abandoning one's parents or grandparents, or refusing to complete the mourning period for them was punished by exile and beating, at best. From the Han Dynasty onward, the practice of mourning rites came to be seen as the cornerstone of filial piety and was strictly practiced and enforced. This was a period of unrest, and the state promoted the practice of long-term mourning to reestablish their authority. Filial piety toward one's parents was expected to lead to loyalty to the ruler, expressed in the Han proverb "The Emperor rules all-under-heaven with filial piety". Government officials were expected to take leave for a mourning period of two years after their parents died. Local officials were expected to encourage filial piety to one's parents—and by extension, to the state—by behaving as an example of such piety. Indeed, the king himself would perform an exemplary role in expressing filial piety, through the ritual of 'serving the elderly' (pinyin: yang lao zhi li). Nearly all Han emperors had the word xiào in their temple name. The promotion of filial piety in this manner, as part of the idea of li, was more an acceptable way to create order in society than resorting to law. Filial piety became a keystone of Han morality. During the early Confucian period, the principles of filial piety were brought back by Japanese and Korean students to their respective homelands, where they became central to the education system. In Japan, rulers gave awards to people deemed to practice exemplary filial conduct. During the Mongolian rule in the Yuan dynasty (13th–14th century), the practice of filial piety was perceived to deteriorate. In the Ming dynasty (14th–17th century), emperors and literati attempted to revive the customs of filial piety, though in that process, filial piety was reinterpreted, as rules and rituals were modified. Even on the grassroots level a revival was seen, as societies that provided vigilance against criminals started to promote Confucian values. A book that was composed by members of this movement was The Twenty-four Cases of Filial Piety. Buddhism stressed individual salvation, and had little room for the interdependent society that Confucianism had created in China, which stressed the good of the community more than the good of the individual. Buddhism advocated monasticism and celibacy, which was unacceptable in the Confucian world view, because it was considered a child's duty to continue the parental line. Therefore, in medieval China, Buddhism was heavily criticized for what neo-Confucianists perceived as a disregard for Confucian virtues and role ethics among family members. In addition, Buddhist monks were without descendants, and therefore did not create the offspring necessary to continue the ancestor worship in next generations. Furthermore, Buddhist monks shaved their heads, which was perceived as a lack of filial piety. A long time ago, the Ch'i people crossed a large river in a boat and it happened that their father fell into the water. His sons rolled up their sleeves, seized his head, and turned him upside down, forcing the water out of his mouth, thus bringing their father back to life. Now, to seize one's father's head and turn him upside down is certainly not very filial. Yet they could have done nothing better to save their father's life. If they had folded their hands and practiced the norm of filial sons, their father's life would have been lost in the waters. The behavior of a Buddhist monk is similar. While on the surface the Buddhist seems to reject and abandon his parents, the pious Buddhist is actually aiding his parents as well as himself on the path towards salvation. The Mouzi Lihuolun also attempted to counter charges that not having children was a violation of good ethics. It was pointed out that Confucius himself had praised a number of ascetic sages who had not had children or family, but because of their wisdom and sacrifice were still perceived as ethical by Confucius. The argument that Buddhist filial piety concerns itself with the parent's soul is the most important one. The same essential argument was made later by Sun Chuo, who argued that Buddhists monks (far from working solely for their own benefit) were working to ensure the salvation of all people and aiding their family by doing so. Huiyuan continued this line of reasoning, arguing that if one member leaves the household to be a monk, then all other members of the family would benefit, having good fortune and leading superior lives. These philosophical arguments were not entirely successful in convincing the Chinese that the behavior advocated by Buddhism was correct, and so other methods were employed. To more directly give Buddhism filial nature, passages and parables that were of minor importance in Indian and Central Asian Buddhism became very prominent in Chinese Buddhism. The story of Shanzi 睒子 ("Syama" in Sanskrit, Sama in Pāli, from the "Sama Jātaka"), is an example of this. Shanzi spent his entire life aiding his blind parents, until he was accidentally killed. But, because of his life of filial devotion, he was miraculously revived. This story is often mentioned in the Chinese canon of Buddhist texts, and is included in a number of different anthologies such as the Liudu Jijing and is referred to by Chinese Buddhist writers. While it is clearly of Indian origin based on the story of Shravan, this tale was virtually indistinguishable from similar Chinese tales. While the tale was transmitted along with Buddhist writings, philosophically it had very little to do with traditional Buddhism. Another story advocating filial piety is that of Moggallāna, a Buddhist monk who goes to great lengths to rescue his mother from condemnation for her unjust life. This story appeared in the Ullambana Sūtra and it is far more relevant to Buddhism than the tale of Shan-tzǔ, though it was still not a particularly important tale in Indian Buddhism. In China, however, these stories became popular tales which were even told among non-Buddhists. Though already part of the Indian Buddhist tradition, East Asian Buddhism raised them from a peripheral role to a central one. Apart from religious texts, the first generations of Buddhists in China responded to criticism from Confucianists by emphasizing the lay life more and the monastic life less in their teachings, and for those who did ordain as monastics, they decided to erect monasteries in populated areas, instead of retreating in the remote wilderness. This was to contribute to the social expectations of Chinese Confucian culture. Another tale that achieved great renown in China was that of the Buddha rising to heaven for three months after his enlightenment to preach his mother. This tale was used to indicate that the Buddha did indeed show proper concern and respect for his parents, in that he cared for their immortal souls. A number of apocryphal texts were also written that spoke of the Buddha's respect for his parents, and the parent–child relationship. The most important of these, the Sūtra of Filial Piety, was written early in the T'ang dynasty. This discourse has the Buddha making the very Confucian argument that parents bestow kindness to their children in many ways, and put great efforts into ensuring the well-being of their child. The discourse continues by describing how difficult it is to repay one's parents' kindness, but concludes that this can be done, in a Buddhist way. Despite being of later Chinese origin, the discourse was accepted as accurate by generations of scholars and society in general, and it played an important role in the development of Chinese Buddhism. Other documents discussing the Buddha's views on the parent child-relationship are probably also of later Chinese origin. The Sūtra on a Filial Son, for instance, shows Chinese, Confucian influence. The Sūtra of Filial Piety was not only a way for Chinese Buddhists to adapt to Confucian ideals, it added its own Buddhist contribution to the concept of filial piety. It added the role of women and poor people in practicing filial piety, and regarded filial piety as a quality to be practiced toward all living beings in this and the next life. Therefore, the sūtra served not only as an adaptation to Confucian values, but also served Buddhist ideals of edification. 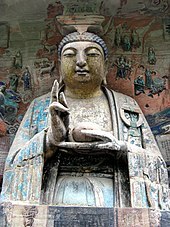 In summary, in order to meet the expectations and demands of Confucian customs, East Asian Buddhism developed its own unique characteristics, which still exist till today. 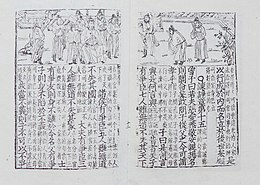 Woodblock print with illustration of The Twenty-four Cases of Filial Piety. Okumura Masanobu, early 1730s. During the 17th century, some missionaries tried to prevent Chinese people from worshiping their ancestors. This was regarded as an assault on Chinese culture. During the Qing dynasty, however, filial piety was redefined by the emperor Kangxi (1654–1722), who felt it more important that his officials were loyal to him than that they were filial sons: civil servants were often not allowed to go on extended leave to perform mourning rituals for their parents. The parallel conception of society therefore disappeared from Chinese society. Unlike western societies, patriarchalism and its enactment in law grew more strict in late imperial China. The duties of the obedient child were much precisely and rigidly prescribed, to the extent that legal scholar Hsu Dau-lin argued about this period that it "engendered a highly authoritarian spirit which was entirely alien to Confucius himself". Indeed, the late imperial Chinese held patriarchalism high as an organizing principle of society, as laws and punishments gradually became more strict and severe. But during the same time, in Japan, a classic work about filial practices was compiled, called Biographies of Japanese Filial Children (Japanese pronunciation: Fu San Ko Shi Dan). Ethnographic evidence from the 19th and early 20th century shows that Chinese people still very much cared for their elders, and very often lived with one or more married sons. In 21st century-Chinese societies, filial piety expectations and practice have decreased. One cause for this is the rise of the nuclear family without much co-residence with parents. Families are becoming smaller because of family planning and housing shortage. Other causes of decrease in practice are individualism, the loss of status of elderly, emigration of young people to cities and the independence of young people and women. To make things worse, the number of elderly people has increased fast. The relationship between husband and wife came to be more emphasized, and the extended family less and less. Kinship ties between the husband and wife's families have become more bi-lateral and equal. The way respect to elders is expressed is also changing. Communication with elders tends to be become more reciprocal and less one-way, and kindness and courtesy is replacing obedience and subservience. In modern Chinese societies, elderly care has much changed. Studies have shown that there is a discrepancy between the parents' filial expectations and the actual behaviors of their children. Especially the discrepancy with regard to respect shown by the children makes elderly people unhappy. Industrialization and urbanization have affected the practice of filial piety, with care being given more in financial ways rather than personal. But as of 2009, care-giving of the young to elderly people had not undergone any revolutionary changes in Mainland China, and family obligations still remained strong, still "almost automatic". Respect to elders remains a central value for East Asian people. Comparing data from the 1990s from Taiwan and PRC, sociologist Martin Whyte concludes that Taiwan, despite this being an economically more modern nation than China, the elderly often received less government support, but received more assistance from their children than in China. In mainland China business culture, the culture of filial piety is decreasing in influence. As of 2003, western-style business practices and managerial style were promoted by the Chinese government to modernize the country. However, in Japan, employees usually regard their employer as a sort of father, to which they feel obliged to express filial devotion. In some societies with large Chinese communities, legislation has been introduced, to establish or uphold filial piety. In the 2000s, Singapore introduced a law that makes it an offense to refuse to support one's elderly parents; Taiwan has taken similar punitive measures. Hong Kong, on the other hand, has attempted to influence its population by providing incentives for fulfilling their obligations. For example, certain tax allowances are given to citizens that are willing to live with their elderly parents. Some scholars have argued that medieval China's reliance on governance by filial piety formed a society that was better able to prevent crime and other misconduct than societies that did so through only legal means. Chinese who immigrate to the United States generally continue to send money to their parents out of filial piety. ^ The Guiyangtu (跪羊图) and Vimalakirti Nirdesa Sutra are also Buddhist works portraying lay householder duties and obligations in contrast with pure monastic renunciation. ^ Ebrey, Patricia Buckley. "Paintings with political agendas". A Visual Sourcebook of Chinese Civilization. Retrieved 12 January 2012. ^ Hamilton 1990, pp. 78, 84. ^ Ikels 2004, pp. 2–3. ^ a b c d e f Yee 2006. ^ Mann & Cheng 2001, p. 46. ^ Sung 2009a, pp. 179, 186–7. ^ a b c Jordan 1998, p. 267. ^ a b c King & Bond 1985, p. 33. ^ a b Sung 2001, p. 15. ^ Cong 2004, p. 158. ^ a b c d e Kwan 2000, p. 25. ^ a b c Hsu 1998, p. 63. ^ a b c d e f Ho 1994, p. 350. ^ a b c d Hsu, O'Connor & Lee 2009, p. 159. ^ a b Kwan 2000, p. 31. ^ Hsu, O'Connor & Lee 2009, pp. 158–9. ^ a b Fung & Cheng 2010, p. 486. ^ a b c Sung 2009a, p. 180. ^ a b Oh 1991, p. 48. ^ a b c d Sung 2009b, p. 355. ^ a b c Kutcher 2006, p. 13. ^ Chang & Kalmanson 2010, p. 68. ^ a b Hsu 1998, p. 61. ^ See Kwan (2000, p. 24), Yee (2006) and Sung (2009a, p. 187). Only Kwan mentions love. ^ a b Cong 2004, p. 159. ^ See Sung (2001, p. 16) and Sung (2009a, p. 187). Only his 2001 article mentions the seats and gifts. ^ a b Sung 2001, pp. 15–6. ^ a b Kutcher 2006, p. 14. ^ Sung 2001, p. 17. ^ Sung 2001, p. 18. ^ a b c Kwan 2000, p. 24. ^ Sung 2001, pp. 16–7. ^ Kutcher 2006, p. 1. ^ a b c d e Jordan 1998, p. 269. ^ a b c d e Hsu 1998, p. 62. ^ Hamilton 1990, p. 92–4. ^ Jordan 1998, pp. 270. ^ See Sun, Long & Boore (2007, p. 256). Hamilton (1990, p. 102, n.56) offers this rendering in English. ^ Jordan 1998, p. 278. ^ Hamilton 1990, p. 84. ^ Hamilton 1990, p. 93. ^ a b Hamilton 1990, p. 95. ^ Chow 2009, p. 320. ^ a b Wang, Yuen & Slaney 2008, p. 252. ^ a b Kutcher 2006, p. 2. ^ Hamilton 1990, p. 100, n.2. ^ Kwan 2000, p. 23, quote: "Xiao xun, the Chinese term for filial piety, commands the younger in the family to be respectful (i.e., xiao) and obedient (i.e., xun) to one's parents and other elderly members related to the family". ^ Baker 1979, p. 98. ^ Hamilton 1990, p. 92. ^ Hamilton 1990, p. 91. ^ Yim 1998, p. 165. ^ Whyte 2004, p. 123. ^ a b c d Fung & Cheng 2010, p. 315. ^ Sung 2001, p. 14. ^ Kwan 2000, p. 23. ^ Sung 2001, pp. 17–8. ^ Sung 2001, p. 19. ^ Sung 2001, pp. 22–4. ^ Kwan 2000, p. 29. ^ For the resistance to change and attitudes of superiority, see Kwan (2000, pp. 27, 34). For the other consequences, see Yee (2006). Ho (1994, p. 361) also describes the link with resistance to change, the learning attitudes, fatalism, dogmatism, authoritarianism and conformism. ^ Ho 1994, pp. 351–2, 362. ^ Kwan 2000, p. 27. ^ Ho 1994, p. 361. ^ Kwan 2000, pp. 27, 34–5. ^ Jordan 1998, p. 276. ^ Kwan 2000, p. 32. ^ Kwan 2000, p. 33. ^ Yim 1998, pp. 165–6. ^ Jordan 1998, p. 274–5. ^ Kutcher 2006, p. 12. ^ Hamilton 1990, pp. 102–3, n.56. ^ Kutcher 2006, pp. 1–2. ^ Kutcher 2006, pp. 2, 12. ^ a b Chan & Tan 2004, p. 2. ^ a b Kutcher 2006, p. 194. ^ Kutcher 2006, p. 35. ^ Kutcher 2006, p. 45. ^ Traylor 1988, p. 110. ^ Hsu, O'Connor & Lee 2009, p. 162. ^ Robert, Thurman. "Vimalakirti Nirdesa Sutra". Retrieved 25 June 2014. ^ Keenan 1994, p. 83. ^ Zurcher 1959, p. 134. ^ Ch'en 1973, p. 23. ^ Berezkin 2015, Ch. 7. ^ Ladwig 2012, p. 137. ^ a b Sung 2009b, p. 356. ^ Sung 2009b, p. 357. ^ Sung 2009b, p. 365. ^ Kutcher 2006, p. 120. ^ Hamilton 1990, pp. 87–8, 97. ^ Hamilton 1990, p. 97. ^ Hsu 1998, p. 67. ^ Whyte 2004, pp. 107–8. ^ Whyte 2004, p. 106. ^ See Fung & Cheng (2010, p. 315) for the nuclear family, individualism, loss of status, emigration and female independence. See Sung (2009a, p. 180) for the causes of the rise of the nuclear family and the independence of young people. ^ Whyte 2004, p. 108. ^ Sung 2001, p. 21. ^ Sung 2009a, pp. 181, 185. ^ Sung 2001, p. 22. ^ Whyte 2004, pp. 117–8. ^ Fu & Tsui 2003, p. 426. ^ Oh 1991, p. 50. ^ Chow 2009, pp. 319–20. ^ Hsu 1985, p. 99.